Kitchens and bathrooms are the most valuable rooms in your home. Upgrading your kitchen cabinets provides your kitchen with a whole new look while adding value to your home. What's more, new cabinets typically give a good return on the initial investment. A well-equipped, attractive kitchen creates a favorite hang-out in the home. If you're ready to create that kitchen, but have a limited budget, refacing your cabinets may be the option you are looking for. Refacing the cabinets in a kitchen gives the room a fresh look while using the existing body or frame of the cabinet. You can do this job yourself or hire a professional refacer. Either way, this method has the potential to save time and money. This process begins with removing the old cabinet doors, drawer fronts and hardware, including all knobs, handles and hinges. Once the doors have been removed, the frames and cabinet ends are resurfaced with hardwood veneer. The veneer is stained and finished to match the new color and finish you've chosen for the doors. Once the veneer is in place, install your new cabinet doors and stand back to admire your fresh new look. If your cabinet box is falling apart or made of MDF, order new cabinets. If you meet these conditions, however, refacing can save you a lot of money on new cabinets and installation. 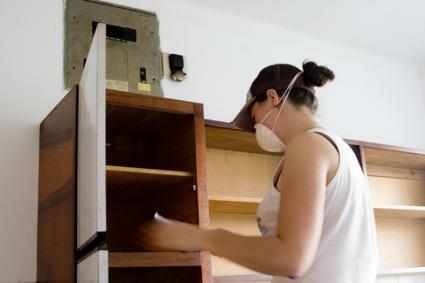 Another option for the do-it-yourself homeowner to replace existing cabinetry is to purchase ready-to-assemble cabinets. Designers will answer questions and help you choose cabinets while also helping you to maximize available space in your kitchen. Many online companies make the designing process easy for you; all you have to do is follow simple steps to lay out your dream kitchen. When you finish the process, a complete set of kitchen cabinets will be delivered to your door ready for assembly and installation. Kitchen Cabinet Kings lets you design and order your new kitchen right online. Their cabinets arrive ready to assemble within two weeks. Merillat offers three levels of cabinets that can fit into nearly any budget. Custom and semi-custom options are available with unlimited styles and finishes, which you can plan and choose online. Kitchen Cabinet Depot sells ready to assemble cabinets at discounted prices. All units are ready to ship, but your styles and finishes are more limited. Hickory and oak are the hardest and heaviest. Cherry, birch and maple also make fine hard woods suited to cabinetry. Alder and poplar present less expensive choices that take well to glazed finishes but tend not to absorb stains evenly. Pine offers a rustic appearance and takes many types of stains well; however, pine is a soft wood and will more easily dent and scratch. 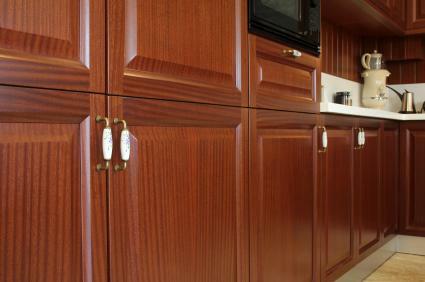 Other cabinet door options include Thermofoil doors, which can be completely finished in a large range of colors. Thermofoil doors and drawer fronts are made from a single piece of manufactured high-quality MDF. A vinyl-like material is applied to the face and edges of the doors using heat and pressure. An adhesive that produces permanent lamination is also added. Thermofoil cabinet doors are durable and ready to install when you buy them. The prefinished surface will provide years of easy-to-clean, maintenance-free use. One caution to take into consideration when installing Thermofoil cabinet doors is the use of self-cleaning ovens. Because of the extremely high temperatures created when using the self-clean feature, install a filler between a thermofoil door and the oven, or leave adjacent doors and drawers opened when the oven is operated in the self-clean mode. There are four basic types of cabinet door shapes to choose from. Slab Flat-style door with no raised or recessed profile, but may have detailed or plain edge profiles. Raised panel Picture frame-like profile constructed with either miter or mortise and tenon joints. Panels may be decorated or grooved. Raised Panel Constructed with frames and panels. Raised panel is usually constructed of several pieces of lumber joined with adhesive. Raised panels might also be made of wood veneers adhered to plywood. Routed Medium-density fiberboard or other material shaped to give the appearance of recessed or raised panels and painted or laminated. Glass doors: Frosted, etched and clear options are all available. Decorative fillers: Fillers sit between the cabinet doors to make extra space in the kitchen. Decorative options include rope, dental detail and carvings. Wine racks: Wine racks can be built into a run of cabinets or they can be concealed behind a cabinet door with different pull out systems. Panels: Create a more custom look by installing cabinet door panels over your refrigerator, dishwasher, trash compactor and at the end of cabinet runs. Slide-out doors: Instead of swinging open, some doors pull straight out, perfect for concealing a trash can or some extra storage. Moldings and toe kicks: These are the final elements that help complete the design. Crown moldings help finish the tops of the cabinets, while the toe kick finishes the lowest part. Decorative options are available for both. Be sure to consider adding updated storage solutions to the cabinets in your kitchen. Storage designs help organize your cabinets with things like trays for cutlery, cooking utensils and cleaning supplies. Another popular solution is rotating shelf sets for dry goods, which make good use of corner cabinets that otherwise provide awkward, hard to reach storage space. With so many options available to you, you may have a tough time deciding which way to proceed for your kitchen renovation. To help you decide, consider these points. If you're doing a complete kitchen renovation and ripping everything out down to the studs, you will want to order custom cabinets if you can afford them. You can use off-the-shelf cabinets for this, but you may have to rely heavily on fillers to make up space differences and the fit may not be as good. The only times you should choose off-the-shelf over custom in this case are the lead time and price: custom cabinets can take up to 12 weeks to come in and can cost up to 10 times as much as readymade. Most off-the-shelf cabinets arrive in two weeks, and many discount options are available to keep the total cost under $2000. While the cost of custom cabinets may run you more, your installation of off-the-shelf may be higher because of the fitting that will need to be done to make the cabinets conform to the space. Custom cabinets also allow you to get the exact finish you want on your doors; after an order is placed a sample door is made and sent to you. You can look at it in your kitchen and make any changes. Production doesn't begin until you are satisfied with every nuance of the door. With readymade cabinets, what you see is what you get. KraftMaid offers custom and semi-custom cabinets that are made to order for you. Finishes and options are nearly unlimited. Planning options are available online. Omega Cabinetry is one of the most well-constructed cabinet lines you can buy. Their units are all made to order with hundreds of options to choose from, and their pricing is still affordable. If you're doing a partial renovation in the kitchen, custom cabinets may be a little pricey for the amount of work being done. A partial renovation usually leaves the footprint of the existing kitchen intact, which gives you more options to choose from. Selecting cabinets and fillers that are identical in size to those that are already there is much easier, and gives you a nice range of readymade cabinets to choose from. Readymade cabinets are usually ready for install within two weeks, which makes both options a good idea for projects on a tight schedule. Your kitchen cabinets should last you for 20 to 30 years at a minimum. Select a style and quality that can last and know that your kitchen is everything you want it to be.